• In blue magic marker: “To David E. Baum, Sellersville, Pa/18960 from Walter E. Baum Estate” (the word “estate” in white chalk). Though the typed biography of Trego on the back identifies the three young men as “the sons of Hohenzollern Kaiser Wilhelm,” this is not the case. Kaiser Wilhelm I had only one son, and Kaiser Wilhelm II, still a prince, had only one son when the painting was done. The princes shown are likely the sons of Kaiser Frederick, who reigned briefly in the year 1888—Crown Prince Wilhelm, the future kaiser, Prince Henry, and Prince Waldemar—as they looked in 1879, the year of Waldemar’s death. The faces of the three princes strongly resemble photographs of the three sons of Kaiser Frederick. 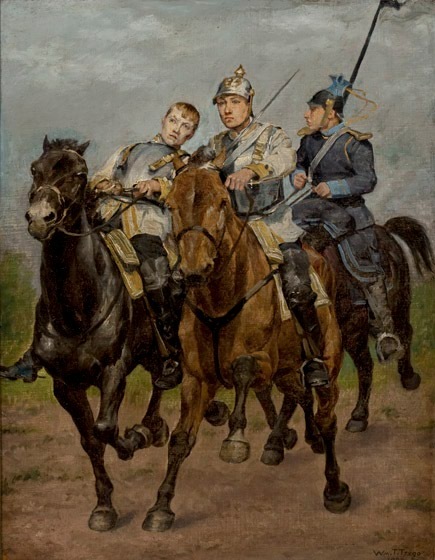 The faces of Henry and Waldemar were repeated in Trego’s 1889 painting, The End of the Charge. The source of the artist’s information about the German royals is not known. The provenance is impossible to trace as can be seen by the information provided on the back on the painting. As The Three Princes in Helen Hartman Gemmill, “William B. T. Trego, the Artist with the Paralyzed Hands,” Antiques [November 1983], p. 996.